Disney Cruise Line Captain Fabian Dib and his shipboard officers will host local port officials and community leaders aboard the 2,700-passenger Disney Wonder for a plaque exchange ceremony in celebration of the inaugural call on San Diego, in accordance with maritime tradition. San Diego is a port of call for the first time as part of four brand-new, seven-night, Pixar-inspired California Coast itineraries on the Disney Wonder from September 16 through October 14, visiting Los Angeles, San Francisco, San Diego and Ensenada, Mexico. 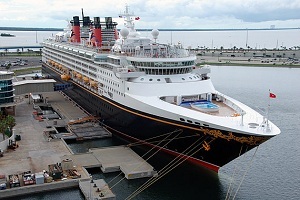 The Port of San Diego has planned a special welcome for the guests and crew members of the Disney Wonder. The San Diego State University marching band will play in the terminal to greet guests as they disembark the ship. After a day of fun in port, guests will be treated to more music from a trio of musicians as they pass through the terminal and board the ship. As part of these four California Coast cruises, memorable characters from Pixar Animation Studios’ award-winning films will make their shipboard debut, while legendary filmmakers and artists share special behind-the-scenes presentations. Guests will also be able to enjoy Pixar feature films onboard, including “Finding Nemo” in 3-D, as well as short films and sneak peeks of future Pixar films. In addition, they can explore the onboard Pixar art exhibit that will showcase movie art from pre-production, story development and more. Following the California Coast cruises, the Disney Wonder will sail a 14-night itinerary to Hawai‘i, then return to California for six Mexican Riviera cruises, before repositioning to sail from Miami for the first time in December.